Remember last night, when I posted that I’d spent the entire day feeling extraordinarily grouchy? Well, three things happened this morning that started me off in such a good mood that I’m still feeling cheery, despite the fact that the rest of my day has been decidedly average. Pretty much the first thing I saw this morning, given that the notification was on my iPhone screen when I woke up, was a Twitter reply alerting me to the fact that Think Geek sells a blue canary nightlight, inspired by “Birdhouse in Your Soul.” I have never owned a nightlight in my entire adult life, but I could not get to their website fast enough to order one of my own. The mere thought of it in my bathroom – in the outlet by the light switch, natch – makes me a little bit giddy. Following shortly after that tweet, I got an email from my friend Liz, telling me the Girl Scout Cookies I ordered from her daughter had arrived. I was very glad to hear from her, because I thought I had been a little too casual in my cookie ordering, relying on Facebook comments and casual mentions in bars rather than the more traditional writing on the long, shiny-paper form. I should have known that Liz would never leave me hanging on something as critical as my Samoa stash. Of course, if everyone I ordered from comes through, I’ll have six boxes of Samoas, which might be overmuch… But better too many than too few! 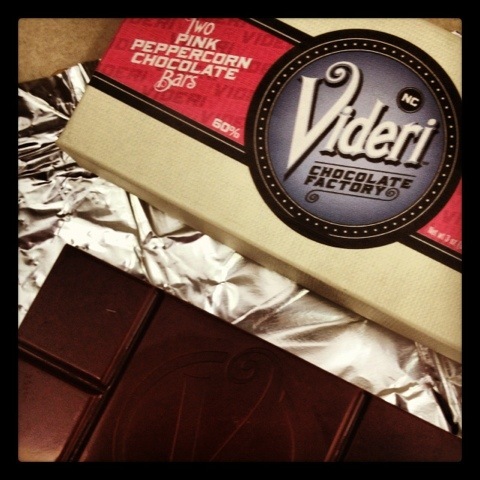 And, completing this morning’s trifecta of awesome, a large amount of chocolate was delivered to the office, courtesy of the folks at Videri Chocolate Factory in Raleigh. (One of my colleagues interviewed them for a blog post last week.) We all already thought they were fabulous because they make organic, fair-trade chocolate in a rehabbed warehouse, but sending us samples of their extremely tasty wares sealed the deal. If you happen to find yourself in Raleigh, give them a visit, eat some yummy stuff, and see how they make the chocolate. Fun and deliciousness! Is it any wonder that my morning left a smile on my face all day? Oh, if any of you are lamenting an actual written post in the place of the usual Wayback Wednesday photoblog, do not despair – I’ll be posting it later. Two posts in one day… I must be happy! Previous Article Who Watches Over You? Next Article Wayback Wednesday: Drama! I think it’s Keebler that makes a Samoa knock-off (more cookies, less money, same taste). I’m all for supporting GS, especially as a former scout…but if you find yourself in a bind or uncomfortable with how cookie profits are distributed, you should know about the Keebler option.